High school football is alive and kicking at Camas County High School in Fairfield, thanks to the debut of 6-man football. The Mushers coached by Jason Ellingson and Randy Jewett have completed seven of eight games on their 2013 schedule. It’s been a learning curve, but the trajectory is upward and the attitudes positive. No matter how many players on the field and regardless of the size of the gridiron, a football game is still a football game during a fine fall afternoon on the Musher premises. Home fans are plentiful and vocal as always, their pickup trucks circling the playing field. The Musher cheerleaders root for their players just like they’ve always done. And when the game is over, the Musher players walk the three blocks down the hard-packed dirt road to the school locker room, carrying their equipment, much like they’ve always done in Fairfield. “Our kids think 6-man football is a blast. It’s a fun game,” said Ellingson after Friday’s home game against the Lima Bears from Montana. Lima (3-4) eventually won 55-14 with five unanswered second-half touchdowns. Yet the halftime score favored the Bears by only 20-14. The main difference between the teams was a shifty skills player named Gavin Duck, who piled up 466 all-purpose, open-field yards. “We had trouble containing that kid on defense,” said Ellingson about the Bears junior. Camas County played Idaho 8-man football for many years until fewer and fewer kids in football pads caused athletic director Jewett to see the hand-writing on the wall. Last fall, the Mushers had only eight healthy players remaining out of a starting roster of 13 and lost their final 8-man football game 60-0 to Dietrich. Jewett, a member of Camas County’s 1977 state championship football team and Musher coach for 16 seasons through 2010, wanted to preserve football as a varsity sport in Fairfield. He decided to join Clark County of Dubois as the main two Gem State 6-man grid programs. Declining enrollments for several years at Camas County and the prospect of more to come caused Jewett to petition the Idaho High School Activities Association, governing body of Idaho prep sports, for approval of 6-man football. The IHSAA board unanimously approved a three-year pilot program for 6-man football, to be reviewed after each season starting in 2013. One big problem was the lack of 6-man teams in Idaho. So Jewett and Ellingson went to work piecing together a game schedule and learning more about the 6-man football rules. Montana has sponsored 6-man football for 30 years and has dozens of teams, so Jewett enlisted two of Montana’s programs, Lone Peak in the Gallatin Gateway, and Lima just over the border from Idaho. He also scheduled three Magic Valley junior varsity programs for games. Raft River of Malta, Murtaugh and Minico of Rupert were sympathetic to the cause, and willing to play. The different rules have been a work in progress. Indeed, during Friday’s game, there was a constant good-natured dialogue between the game officials, coaches and even the fans along the sideline about what was permissible. For instance, the field is smaller, 80 yards in length compared to 100. Quarters are shorter, 10 minutes instead of 12. First downs are 15-yard advances instead of 10. All players are eligible to catch a forward pass. Extra-point kicks count for 2 points, and field goals for 4, whereas the 2-point conversions of 8-man and 11-man football count for 1. Most importantly, the ball can’t be advanced on a run after the snap from center until a second exchange is made. On Friday, the Lima Bears’ strategy called for the offensive center to snap to a player positioned 5 yards back, and then that player would lateral the ball backwards to the quarterback, another 5 yards behind. Lima 175-pound junior quarterback Duck was usually that player positioned deep. He would sense the dangers posed by the two Musher pass rushers and fake them out to find room. Duck found plenty, rushing for 223 yards and three touchdowns, and completing 13-of-20 passes for 190 yards and two other scores. Simply put, he made the Musher tacklers miss. Duck also intercepted a pass and recovered two fumbles, one for a 35-yard TD return. The Bears scored five times in a six-minute span in the third quarter. The lopsided final score was much like the 40-19 loss to Lima that Camas (2-5) sustained on its Sept. 21 trip to Montana. Camas County, in contrast, had just installed a grind-it-out, single-wing offense two weeks ago. The offensive center would snap to a teammate standing right behind him, at a right angle, and that teammate would then set a running play in motion with a lateral or a hand-off. Sophomore Shawn Allbritton rushed 15 times for 98 yards and one touchdown. Junior Isaac Simon added 81 rushing yards, and senior quarterback Cale Homer rushed for 56 yards and completed 2-of-16 passes for 46 yards. Simon also returned a fumble for a 59-yard TD. It was wide open football, putting a premium on open-field tackles and the ability of passers to find open receivers while on the move. There were frequent onsides kicks. There wasn’t a single punt taken. Lima piled up 452 yards, and Camas County ended with 412. Friday’s loss snapped a modest two-game Camas winning streak that started with a home win over the Murtaugh JV Oct. 2. Biggest success was a 25-18 home win over Clark County Oct. 11 that avenged a 45-19 loss at Dubois Sept. 27. In that win, Camas built a 19-6 lead on Isaac Simon and Shawn Allbritton touchdown runs, and a 16-yard scoring pass from Cale Homer to Erick Peterson. 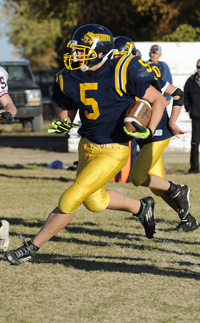 Allbritton’s 4-yard scoring run in the fourth quarter secured the victory. Camas County finishes its season today, Wednesday with a 3:30 p.m. home game against the Minico junior varsity. Lima—Gavin Duck, 5-yard run (pass failed); 5:31 1st (6-0 L). Lima—Caden Clarno, 9-yard pass from Gavin Duck (kick failed); 8:00 2nd (12-0 L). Camas County—Shawn Allbritton, 1-yard run (Allbritton run); 7:23 2nd (12-7 L). Lima—Stephen Herriott, 5-yard pass from Caden Clarno (Andrew Rickey kick); 6:20 2nd (20-7 L). Camas County—Isaac Simon, 59-yard fumble return (Simon run); 0:09 2nd (20-14 L). Lima—Gavin Duck, 12-yard run (kick failed); 8:49 3rd (26-14 L). Lima—Caden Clarno, 15-yard pass from Gavin Duck (pass failed); 8:14 3rd (32-14 L). Lima—Gavin Duck, 16-yard run (Guy Hales, pass from Duck); 4:56 3rd (39-14 L). Lima—Gavin Duck, 35-yard fumble return (Duck kick); 4:10 3rd (47-14 L). Rushing—Shawn Allbritton 15-98, 2 1sts, 1 TD; Isaac Simon 13-81, 3 1sts, 1 conv. ; Cale Homer 8-56, 2 1sts; Erick Peterson 3-18, 1 1st; Jordon Moore 2, -1. Passing—Cale Homer 2-16, 46 yards, 1 1st, 2 interceptions. Receiving—Erick Peterson 1-39, 1 1st; Nick Martin 1-7. Fumble recoveries (1)—Isaac Simon 1 with a 59-yard TD return. Sacks (4)—Jordon Moore 2-29; Moore and Nick Martin 1-4; team 1-15. Tackles (30)—Jordon Moore 6, Erick Peterson 5, Nick Martin 5, Trent Rock 5, Shawn Allbritton 4, Isaac Simon 4, Zach Overby 1. Rushing—Gavin Duck 14-223, 5 1sts, 3 TD; Caden Clarno 6-30, 1 TD; team 2, -23. Passing—Gavin Duck 13-20, 190 yards, 4 1sts, 2 TD, 1 conv. ; Caden Clarno 2-7, 20 yards, 1 1st, 1 TD. Receiving—Stephen Herriott 7-129, 4 1sts, 1 TD; Caden Clarno 5-62, 1 1st, 2 TD; Andrew Rickey 1-9; Cole Messenger 1-8; Guy Hales 1-2, 1 conv. Fumble recoveries (3)—Gavin Duck 2 including a 35-yard TD return; Sam Congdon 1. Interceptions (2)—Gavin Duck 1 with an 18-yard return; Andrew Rickey 1 with a 5-yard return. Tackles (53)—Caden Clarno 18, Stephen Herriott 11, Gavin Duck 9, Sam Congdon 5, Andrew Rickey 5, Willie Ewing 3, Guy Hales 2.